Nigerian man left speechless after spotting An Arab woman who washes windscreen in traffic. The Nigerian man was shocked after seeing a white woman and a friend washing the windscreen of a car in traffic for little change. The lady and her friend both had a bottle filled with liquid wash and the foam wipe used to clean windscreens. 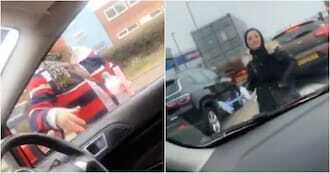 Nigerian Man Left Speechless After Spotting An Oyinbo Woman Who Washes Windscreen In Traffic For A Living In The UK!! !